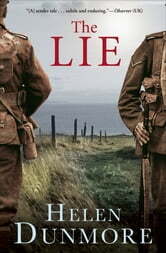 A British World War I veteran returns to Cornwall in this “enthralling novel of love and devastating loss” from an Orange Prize winner (Good Housekeeping). Cornwall, 1920: Infantry officer Daniel Branwell has returned to his coastal hometown after the war. Unmoored and alone, Daniel spends his days in solitude, quietly working the land. However, all is not as it seems in the peaceful idylls of the countryside; and although he has left the trenches, Daniel cannot escape his dreadful past. As former friendships reignite, Daniel is drawn deeper and deeper into the tangled traumas of his youth and the memories of his best friend and his first love. Old wounds reopen, and old troubles resurface—though none so great as the lie that threatens to ruin Daniel’s life, the lie from which he cannot run. Told with breathtaking poise and exacting suspense, The Lie is a haunting journey through the mind of a tormented man as he tries to fit the pieces of his shattered past together.